It’s such a wonderful thing when world’s collide. Take this Sunday night’s guest appearance by Emma Caulfield on Once Upon a Time, for example. Or if you’re looking for something a tad bit shinier, someone left a Hammer on the library table on the set of Community. 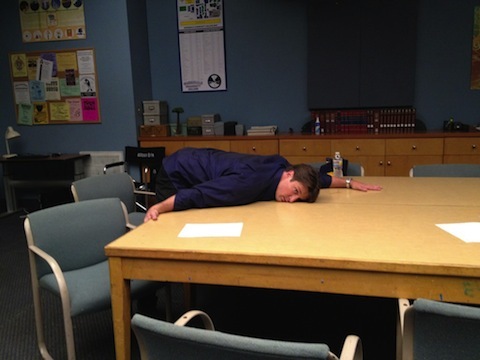 If those hints add up to something that makes sense to you, you may be a Nathan Fillion fan. Should we expect a guest appearance by Fillion on Community at some point in the future? I’m afraid to get my hopes up as there's a good chance this was just a friendly drop-by that Fillion was kind enough to share with us. Still, the lack of new Community feels particularly frustrating this week, given that last night was the first official Thursday without Community this year (NBC brought back 30 Rock, Parks & Rec, The Office and Up All Night with new episodes). News or even a hint that Fillion is on the menu for the series’ return, whenever that may be, is just the kind of geeky uplift fans could use.